This weekend we went to our friend E’s 3rd birthday party. It seems like yesterday that he turned one. I’m sure I’ll feel the same way when we celebrate his 18th! The party theme was dinosaurs. E loves them. I always run into a problem when buying kid birthday presents…or any presents for that matter. I hate giving ordinary or the expected gifts. There are so many plastic toys out there. I wanted to get something for E that could foster his pretend play, which is in high gear at 3, and something cool and magical that involved dinosaurs. I searched online for ideas. I found these glass terrariums on Ohdeedoh, but E has a 10-month old sister so no way could I get him a large glass jar for his dinos. But the post inspired me to create a dino-world. I used a storage box we had here at home. For the exterior I tried to create a camouflage pattern to cover the box. 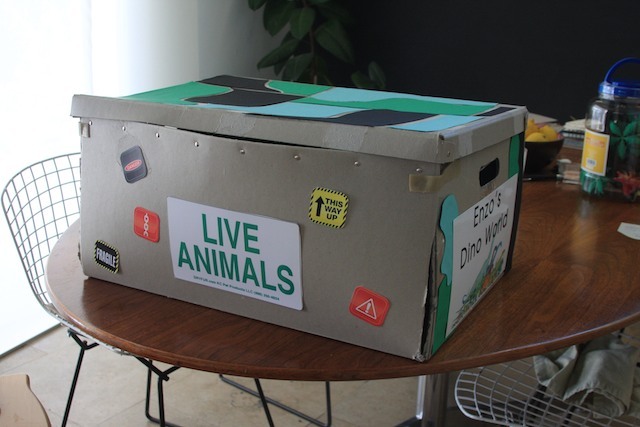 I made signs that said “E’s Dino World” and made labels like “live animals” and “danger” to go on the front panel that opened down. 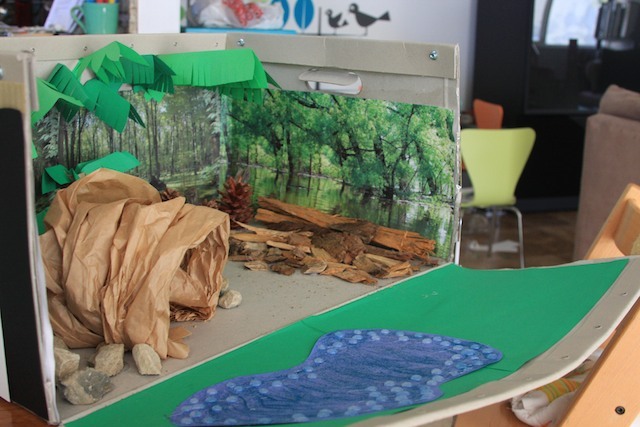 The inside had swamp images all along the back three walls with overhanging palm leaves created out of construction paper. 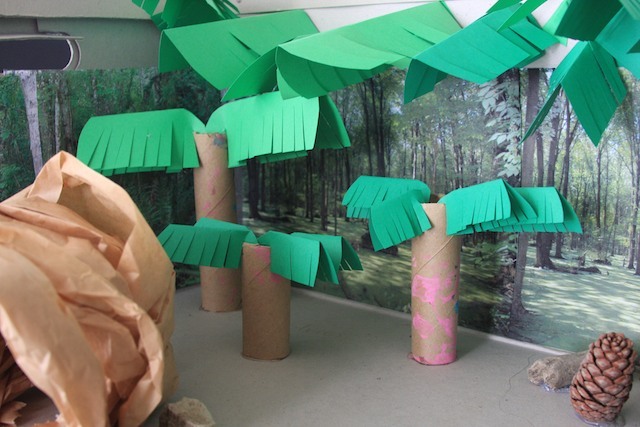 The three palm trees were made out of the same construction paper and a paper towel tube. P helped by cutting the palm leaves. 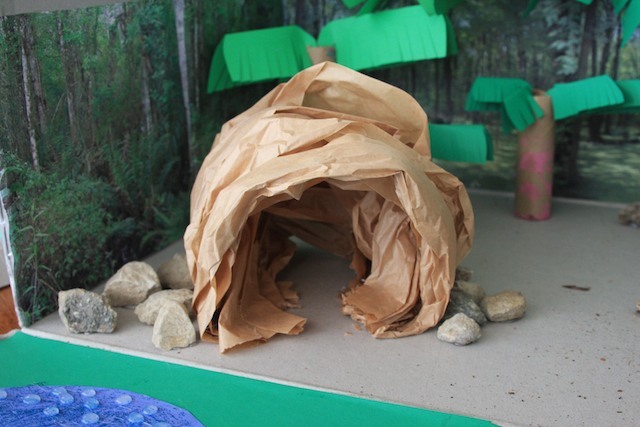 The cave was made out of paper that’s normally used to cover things when painting. It’s kind of like parchment paper. 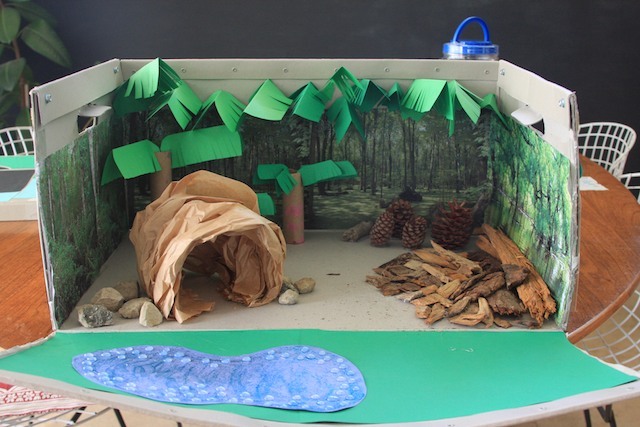 I wanted to use real materials as well so P and I went off in search of pine cones, rocks, bark and sticks. 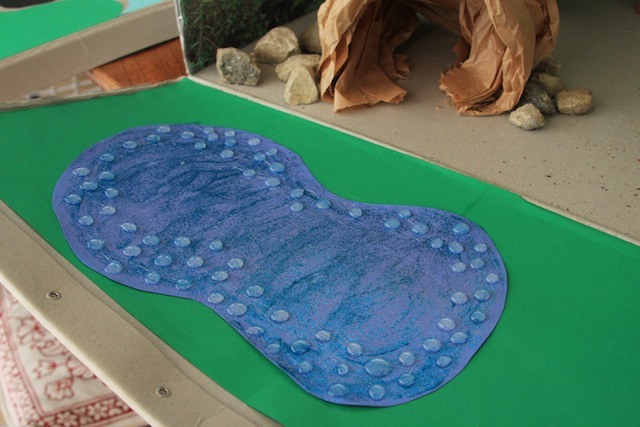 And the lake was made out of construction paper with a layer of blue glitter glue and drops of hot glue gun glue. Everything was glued down so no rocks or sticks can go into E’s little sister’s mouth. P and I had a great time making E’s dino world. We bought him a jar of dinosaurs from Target to complete the whole thing. P now wants a “princess forrest” as she calls it. So, we’ll be making another imaginary play box this week. I asked D to remind me in the future to let P make her own school projects. I really love doing stuff like this. It’ll be hard to watch her do it alone.